I feel like this review is a little harder for me to write. Mainly because I have this weird relationship/connection with Merit. I don’t think I liked her too much because I identified with her too much. I saw a lot of myself within Merit. But alas, without Merit (see what I did there) this book wouldn’t have been what it was. The only thing I had a huge issue with was the father. And while I won’t go into details because I don’t roll with spoilers in my reviews, I just don’t like how a lot of the issues were handled by him. But I understand why Colleen wrote it that way. Every family has their issues and their flaws. Now I will say this, when Colleen says on social media that this is unlike anything she has wrote before, I agree with her. It’s not. Take all of those expectations away because they won’t be exceeded. Maybe this is what happens when Hopeless and Slammed come together and make a cute little baby. And the best part about ALL of it is in true Colleen nature, she brings you through some darkness and rough patches but she is always following through with that wrap around, that good stuff, that happiness. My favorite part of the entire book is the layers. The layers of Merit, of Honor, Utah, Sagan. ALL of their layers. And Colleen spares no one. All of those said layers are uncovered at a wonderful pace that keeps you turning the pages. To all of Colleen’s readers, this book will portray something beautiful. Something that every one might be struggling with. 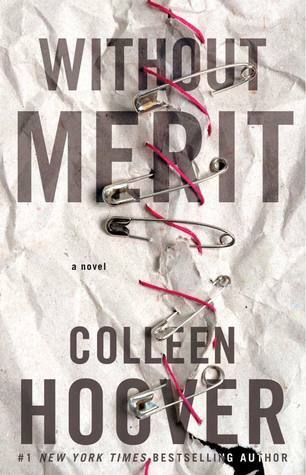 You could relate to any of the characters in Without Merit and still come out with a smile on your face. Because hot damn. Colleen knows how to tell one hell of a story.